A few weeks after a healthcare visit, you should receive what is known as an “explanation of benefits” (EOB). The EOB provides information about your visit, as well as information about what the insurance company covers, and your end of the bill. Look at the date of your healthcare visit on your EOB. Did you, or someone listed on your health insurance policy see someone on that date? If not, that could be an indication that your identity has been stolen for medical purposes. This happens more than you might think. In fact, my sister’s identity was once stolen by a co-worker and used during a hospital admission. Carefully comb through your EOB for red flags that indicate that someone else is using your identity for healthcare services. Curious about how much your healthcare costs? The EOB can help you out. It lists how much the visit, procedure, or lab work costs, and you can see exactly how much the health insurance company is paying, and how much you are paying. This is information you might be able to use later. It can also give you an idea of how much servicesÂ should cost, allowing you to identify billing errors on future EOBs. In many cases, your EOB includes information about how much of your deductible has been used up to this point. You can see how much you still have to pay. Additionally, many EOBs also include information about how many preventative care visits you have had, and how many you have left, so you know where you stand in terms of making a co-pay. Did you have a health insurance claim rejected? If so, the EOB can provide you with information about why your insurer decided not to pay the claim. The reason might be that you don’t have coverage in the policy for that condition, or that you didn’t get pre-approval for a treatment, or that the healthcare provider neglected to submit all the necessary information. The wrong billing code might also have been used. If your claim has been rejected, look a little deeper into the situation. If it’s a mistake, the claim can be resubmitted and possibly paid. It’s important to understand that your EOBÂ isn’t a bill. However, it can show you how much you still owe your healthcare provider. The difference between what the service provider charges, and what the health insurer actually pays is what you owe. Additionally, most EOBs have a section that indicates “your responsibility” somewhere on the documents. You should see a bill from your healthcare provider shortly after receiving your EOB. That is what you will need to pay. And it doesn’t matter how small the number is. There have been times that I have had to pay $3.62 or even as little as $1.97. It’s all numbers and computations. 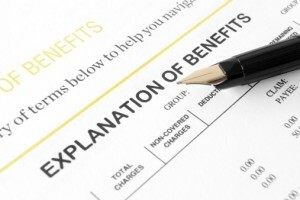 What other things can you learn from the explanation of benefits sent by your health insurer? 1) Whether you went out-of-network. Many EOBs will note if you went to an out-of-network provider, which will be more expensive for plans such as HMOs or PPOs. 2) Service limits. If your plan covers a certain number of physical therapy or chiropractic visits per year, you should be able to see how many you have left. The EOB is definitely a good document to hang onto, especially, if the healthcare provider bills you. You can double check to make sure what you’re being billed is in line with what was remaining after insurance paid.